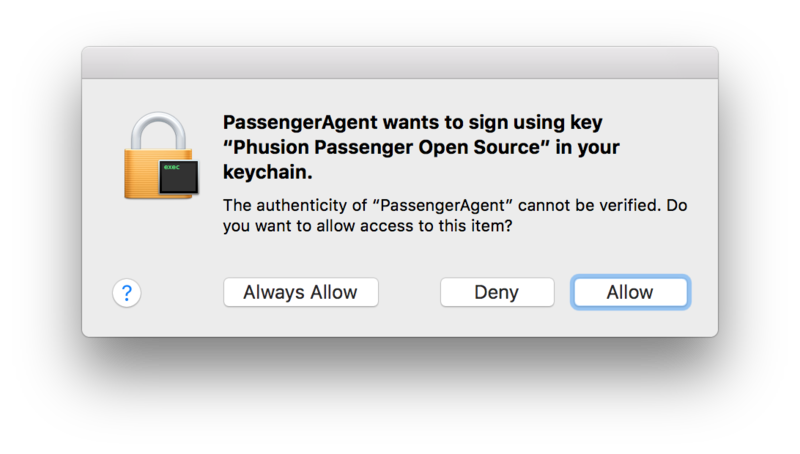 Passenger 5.1.0 and 5.1.1 have a bug when used with the system Apache on macOS, the certificate is incorrectly added to the "certificates" section of the System Keychain instead of the "My certificates" section of your personal keychain. This has been addressed in 5.1.2 by providing the apache user with a private keychain while passenger is running. Why is Passenger accessing my Keychain? Passenger 5.1 and later include a security update check, which periodically contacts Phusion's server to check if an update is available, and whether the update contains security fixes. One of the mechanisms that Phusion has employed to maintain the security of this system is to enforce both server-side and client certificates. The client-side is implemented using libcurl, which on macOS (Mavericks or later) is backed by the macOS Security framework and a small shim in libcurl called darwinssl. Passenger prepares an access rights object to allow itself to use a certificate that it loads. Passenger uses said access rights object while loading the client certificate manually before libcurl has a chance to. Loading the client certificate in this way adds it to the keychain with Passenger authorized to use it. Passenger then calls libcurl to load the client certificate, which is automatically provided from the Keychain, with the correct access rights. Passenger makes the https call to the update check server. Passenger then removes the client certificate from the Keychain. (For more details on why this is necessary you can read this blog post). If after following this procedure you still see Keychain popups, please contact Phusion support and we will be happy to help you.